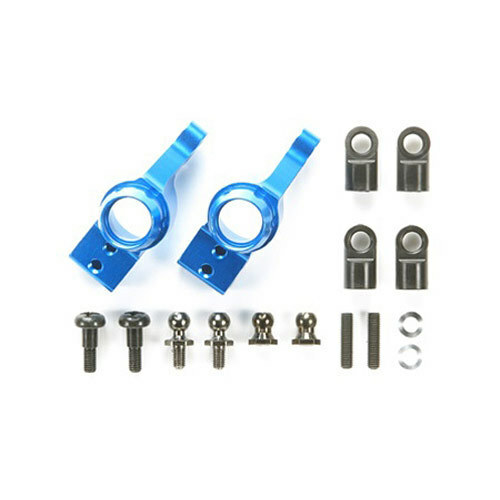 These aluminum rear uprights feature 2.0 degree toe-in angle (same as kit standard resin uprights). When installed onto M-05 chassis, rear toe-in angle will be 2.0 degree. When installed onto M-06 chassis, rear toe-in angle will be 3.5 degree. Aluminum Rear Upright (2.0 degree) L x 1pc. Aluminum Rear Upright (2.0 degree) R x 1pc. Can be used with M-05, M-05Ra, M-05PRO, M-06PRO, and M-06 chassis cars. For M-05 chassis cars, use with M-05 Adjustable Upper Arm Set (54182) and 1050 Ball Bearings (51239). For M-05Ra chassis cars use with M-05 Adjustable Upper Arm Set (54182), 1050 Ball Bearings (51239), and Aluminum Rear Upright (2.0 degree) Adapter for M-05Ra Chassis (54266). For M-06PRO and M-06 chassis cars, use with 1050 Ball Bearings (51239).